Drum roll please!! The moment we’ve all been waiting for, when giant chrome bullet hens finally enter the river in fishable numbers!! Over the past three days, we’ve had double digit hooks ups, lots of fish on, and lots of steelhead brought to hand! Winter has (mostly) lost it’s grip on Michigan, and we can finally look forward to warmer temperatures and outstanding steelhead fishing! Water temperatures remain cold so spawning is several weeks away, however, the “Bobber” bite has been ridiculous! Floats and spawn have definitely been getting it going in a big way! Spawn, beads, and jigs with wax worms have all been fishing well. Seems like everything is starting to bust loose and break open into actual Spring! Both the Muskegon River and the “Flies Only” section on the Pere Marquette and both beginning to fish well. We should start seeing numbers of fish in both rivers. Fishing forecast for this weekend, and next week looks great! Jake, Kodie, and I are guiding the Muskegon River. Ryan White is available for float trips on the Pere Marquette River, “Flies Only” sections. BGS FaceBook Page for updates. March, 9. Spring Steelhead are finally here along with some much needed, warmer weather! The Muskegon River is free from ice flow and open, well down to the lower section, Mystery Creek Campground area. The river ice flows in the lower river should open more each day. Croton Dam through the Newaygo area is ice free, and gin clear, flowing nicely. Steelhead run should begin in earnest, with lots of new fish entering from Lake Michigan. The first three days of the Spring Steelhead 2015 have started out well to say the least! Temperatures are finally starting to warm up and the steelhead and trout have certainly begun to take notice! If things continue to keep going like this, we should have a phenomenal Spring run. I’m looking forward to this guide season!! Late Winter offers a chance at trophy Steelhead with few anglers on the water. Thane with a beast of a hen from the Big Manistee River. Spring Steelhead are starting! Croton Dam Fishing Report for the Muskegon River. Steelhead & Trout tours near Newaygo, Michigan. Located very close to Grand Rapids, Mi. Fly Fish. Best ticket for big fish has always been our tried and true, floats and spawn, drifted through the runs and deeper holding water. A close second has been fishing hand tied fly jigs tipped with wax worms. Gorgeous Steelhead brought to hand before the crowds of April swarm the river. Solitude in fishing the winter – early Spring. Awesome Spring Steelhead Fishing! Molly with a big Steelhead from the Muskegon River. No doubt that winter has had an awful grip on us lately, with cabin fever running high, everyone needs to get out of the house and do some fishing!! Expected temperatures should be on the rise for next week, with excellent fishing opportunities in store for us coming up. Late February and March offer anglers some of the best Steelhead and Trout fishing of the year. During the winter months, angling pressure is minimal and the fish get a rest, usually food is limited this time of year so trout and steelhead are on the feed during the warmest parts of the day. Trout fishing is also phenomenal during this time of year! 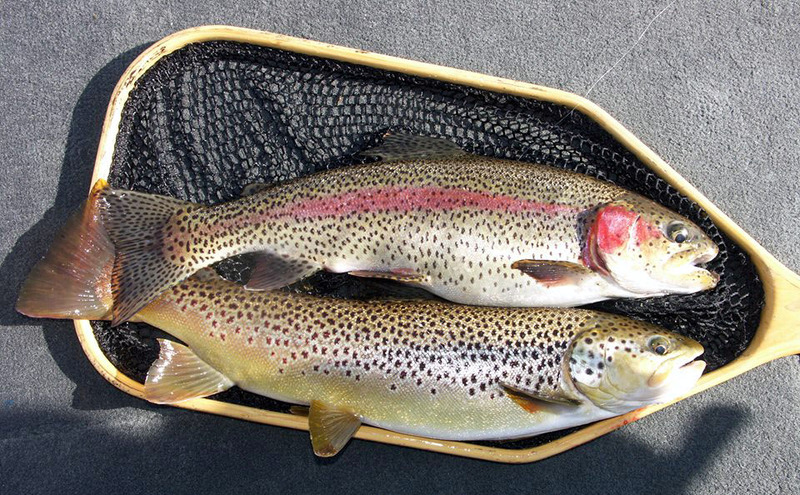 Many, very large trout are caught during this time of year! BIG Fish for the grin and grip! Winter can’t last forever, now is a great time to get out of the house and chase some chrome! During early Spring we land some of the largest Steelhead, and trophy brown trout of the year! Less anglers offers better chances at some big fish. As fishing guides, we welcome the solitude of March on the river with great fishing before the crowds of April bring hordes of people and boat traffic. Its definitely refreshing to have the river to yourself while catching lots of fish on light tackle.BGS FaceBook Page for updates.